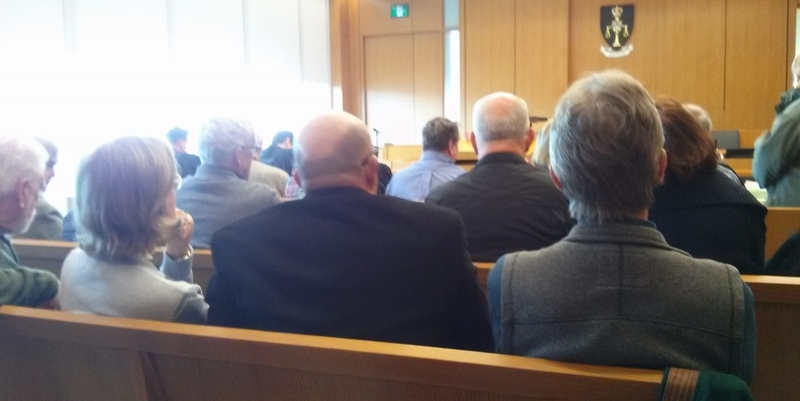 There were so many people attending the hearing at the Ontario Superior Court in Belleville Monday that there was a half-hour delay in the proceedings so a larger courtroom could be found. That was just the beginning of the changes that day, as the Alliance to Protect Prince Edward County (APPEC) took on the Independent Electricity System Operator (IESO) over its awarding a new contract to Germany-based wind power developer wpd Canada and the White Pines project. The power project was diminished from 29 to 27 then nine turbines in various citizens’ appeals, and it was thought since the power developer had not only missed all its milestones stipulated in the contract it also now failed to meet the 75% of power required, the contract might be null and void. The public has “no right” to know what’s in multi-billion-dollar contracts that are the result of public policy. Not in Ontario. Not where “wind is green, wind is good” and citizens’ voices don’t matter, nor do communities, or democracy. No: instead, the IESO simply cut the developer a new contract. And the public? You have “no right” to know anything. Here is a formal report by APPEC. Mr. Justice Kershman presided over the hearing of final submissions at the Belleville Courthouse. The turn-out was excellent with Mayor Quaiff, Councillor Ferguson, Wind Concerns Ontario President Jane Wilson and about 75 County residents attending. In fact, the Court Clerk was forced to find a larger courtroom to accommodate the crowd. Eric Gillespie began by pointing out that this case raises broader public policy issues of access of information from the IESO. On June 12, 2017 APPEC contacted the IESO for information about the status of WPD’s FIT contract. The IESO indicated in its reply that it could not disclose this information, citing confidentiality. Mr. Gillespie argued that this information should have been disclosed for the following reasons: (1) the IESO describes the FIT program as a standardized, open and fair process; (2) APPEC and Ontario communities are affected by the FIT Program; and (3) the information APPEC was seeking, and the IESO withheld, could not have been confidential at all as it was ultimately disclosed to the Court in November 2017. Mr. Gillespie clarified that contrary to what the IESO contends, this is not about how to interpret clauses in the FIT contract. The clauses are negligent misrepresentation, in that APPEC was led to believe that the generation capacity of the White Pines project could not go below 75% of the generation contracted for in 2010, when the FIT contract was signed. The central issue for APPEC is that information that became known to the IESO was not made publicly available. The IESO had a choice, when it became clear that WPD could not meet the 75% condition in the contract. It could have said that things had changed, that WPD’s FIT contract would need to be amended, that WPD was in default of contractual milestone dates, etc. Mr. Gillespie noted that it’s what the IESO and WPD did with their choices that has brought us here today. WPD’s first public announcement that it was proceeding with the 9-turbine project was September 21, 2017. The IESO informed Councillor Ferguson that it had agreed to amend the FIT contract on October 12, 2017. APPEC only obtained the information it had sought in June when the IESO disclosed it to the Court on November 30. Mr. Mark indicated that the IESO has made no representations to APPEC at any time, so it could not have made a negligent representation. When Judge Kershman asked whether APPEC’s allegation is that the IESO made a representation in 2010 that the Project would not be able to proceed if the project’s generation capacity fell below 75%, Mr. Mark responded that this isn’t the case APPEC is making. Mr. Mark noted a statement in the Skypower Decision that the FIT contract is a bilateral commercial contract between two parties. Mr. Gillespie noted that in the same Skypower Decision, Judge Nordheimer rejects this characterization of the FIT program, and says that the suggestion that this is a commercial nature entirely and not a matter of public policy is fictional. Mr. Mark said that APPEC had all the information it needed and ignored this information at its peril. In reply, Mr. Gillespie asked why APPEC would base its ERT appeal rights on a complete unknown, i.e., would the IESO amend the FIT contract, or not? Patrick Duffy, legal counsel for WPD, also took up the argument that APPEC had no right to insert itself into the contract between the IESO and WPD. Mr. Gillespie replied that if that was so, then why did the IESO make FIT contracts available on its website for public viewing in the first place? Mr. Duffy stated that the terms “open” and “transparent” only apply to FIT Program Applicants, not to members of the public to which Mr. Gillespie replied that we still have not been told what there was about the information APPEC sought that was privileged. Mr. Duffy noted that FIPPA (Freedom of Information and Privacy Act) is the law that applies to disclosure. However, Judge Kershnan reminded Mr. Duffy that Mr. Gillespie had already noted in his submissions how long the FIPPA process takes. Mr. Gillespie also noted that there was nothing in any of the other Party’s materials about FIPPA. Mr. Gillespie concluded by noting the right of County residents to natural justice and procedural fairness. The IESO has not told the whole story to the community that will be affected by the White Pines wind project. Justice Kershnan thanked the Parties and stated that he would reserve his decision. The hearing was adjourned at about 5:30 p.m.
What happened to that “engaging with communities” that is vital? Engagement is clearly a limited process with the IESO deciding what you get to know. Mr Mark’s definition of a contract (“a statement at a point in time but no guarantee it won’t change in the future”) has implications for all those other wind power contracts out there. They CAN be changed, apparently … or CANCELLED? What about the concept that the IESO is an entity that represents and works on behalf of the citizens of Ontario and who, as their employer, have every right to knowledge of the IESO’s activities and commitments? Shouldn’t there be a criminal investigation into all of this? Sommer, for a criminal investigation to take place a reasonable expection that a crime has been committed is needed. What crime do you suspect? What evidence do you have that a crime may have been committed? Take a look at this story. It was just published today. Anyone who can sit back and watch this happening and not suspect criminality is complicit! Sommer, you disagree with the report. I suspect it is horse manure. No crime is evident. If you are sincere in your belief contact the OPP. See if you can get them interested. Get together with others and fund a lawsuit or a private criminal prosecution. There are some suggested avenues for you to follow. The question boils down to this. Do we, as taxpayers, now have the power to see any contract our government signs? If we have that power then let’s see the contract. I suspect that we do not, at this time, have that power. The next question is should we have that power? Everyone wake up! The employer, so you ask, of IESO is Kathleen Wynne. When the proposal about another non-profit, non-governmental, non-whatever organization was tabled many in the power sector asked what this one was for. At that time we already had multiple commissions, committees, organizations and associations all expecting their paycheques from the hydro account. Most involved with these entities know nothing about the power system yet produce huge amounts of bogus diatribe to justify their positions and promote their intended agenda. Someday, to prove my point, read about the Canadian Electricity Association and check out who their lobbyists are. Without these, at-arms-length, over educated idiot departments, senseless projects like the IWT’S in eastern Ontario would never happen. Now, the real truth is, these back room make work schemes do keep people paying taxes. Good or bad, taxes are a government necessity. As of about 2004 telling the simple truth is just not complicated enough. Read about how the lines get blurred to the point where lobbyists must be investigated for ethics and integrity. Then google some examples of this in Ontario. Also we need to draw Venn diagrams to show how the ‘revolving doors’ work in Ontario. Take a look at this example in the U.S. of the ‘revolving doors’. Most pension plans, if not all pension plans, have a fiduciary duty to attain the highest rate of return for their members. They invest where they think they will reap the most return (the investment must be in a legal company). The wishes of the members of the plan have very little to no say on where the investments are made. So, if a member does not want his/her pension plan to invest in wind farms they can write the plan. The plan will read the comments and then invest where in what they think are the wisest investments. Clear patterns are emerging. Information is in the public domain. “According to court documents, wiretap transcripts and interviews with officials familiar with the investigations, mafia involvement in the renewables sector followed a familiar path. Crime families and businessmen would target land suitable for wind or solar plants, sometimes pressuring landowners to sell or offer long-term leases. Corrupt local officials were enlisted to speed through application processes that could otherwise take three to six years. After receiving approval, they would approach foreign investors eager to tap the … government’s green subsidies program.